7 hours of the main campaign, 2 hours of a repeat playthrough, totalling 9 hours. Like This War of Mine, Frostpunk is a game that is about the survival of communities. Both games are productions of 11bit Studios, the Polish studio that's also behind games like Beat Cop and Anomaly. Gathered together within a crater around an aging steam generator, survivors hold on to hope against an unforgiving cold that's suddenly gripped the world. This is the essence of Frostpunk, which burdens you with the tremendous responsibility of managing what seems to be the last bastion of humanity, and shepherding it towards self-sufficiency. You'll need hunters and hothouses, saw mills and mines, and many other things to guarantee that people are not only fed, sheltered, and warm, but that they have hope. Each in-game day starts at 5:00 AM; your workers have little precious time to help with construction before they head to work for 12 hours. Then they return home, finish a few small tasks, and go to bed. Life is drudgery in Frostpunk, but hey, it's better than dying in the cold, right? Your decision-making process can and should revolve around this schedule. You'll always need to be sure you've gathered enough fuel throughout the workday to have enough to keep the generator running through the night. And as the community grows, you'll build outwards in concentric rings to ensure that as you expand, your generator core can keep up with your people's need for warmth. Though there are higher difficulty settings, Frostpunk is by default enough of a challenge - one is constantly worrying for one's people. I know I was a bit overwhelmed by the myriad demands, as few other strategy games of recent memory have asked you to balance the survival of your wards against the sacrifices that might be needed for the greater good. But after a while, the game settles into a natural rhythm, and every day, it's the little challenges that help pull everything together to ensure you don't feel too adrift. The challenge in games like these, just as in This War of Mine, are not just that decisions you make matter (for example, such as whether discontent is tolerable as a price paid for more pressing needs), but so does knowing when they need to be made. Very often, challenges are the emergent consequences of past decisions. If your people manage to survive through the night, despite insufficient heating, then yay, but now you'll have to deal with them catching ill. Neglected issues can also make your people increasingly strident, but unlike in SimCity, discontent can't just be laughed off - a seemingly small issue can mean the difference between your folk being dour or desperate. When that happens, a simple need may blow up into a series of projects that take days to finish, while meters of discontent and hope slide ever against your favor. Thankfully, Frostpunk has been balanced for elegance and precision, not unlike the fine clock that your growing city begins to resemble. In essence, the real meat on the bone of Frostpunk is keeping watch on those meters, remaining ever vigilant over not just the cold, but the city's morale. Cold snaps and work accidents and all manner of unavoidable disasters crop up that require immediate intervention. A compassionate act will give people hope, reminding them that humanity prevails, while a law that prioritizes survival can drain it. You're not just playing paragon and renegade, but deciding what price you'll pay in the long run. For instance, taking on ill refugees gives light to people with an assurance that everyone is cared for. But given the scarcity of quality health care in the frozen post-apocalypse, you'll surely expend resources in treating their sickness. Succeed and you'll have an able-bodied community whose spirits have been lifted, but fail and you'll have corpses spreading not just disease, but despair. That's what separates Frostpunk from every other god game, management sim or city builder: the tension between ethics and expediency, morality and morale. Your decisions aren't just about the economics of whether one building is better suited for your present needs than another, or whether one project is more cost-effective than another. Rather, your decisions are a series of transactions that cost you either your humanity or your principles. Early on in Frostpunk's tutorial, you're told that people are always looking for a solution, and prefer an immediate one over the best one. After while, you'll find that this where the game's difficulty lies – not in an internal math written to challenge you, but in the cynically bleak questions it asks with every in-game day. The days ahead are difficult not because the world is harsh and cold, but because of the compromises you have to make, the discontent you must ward off, and the hope you have to sustain in spite of it all. 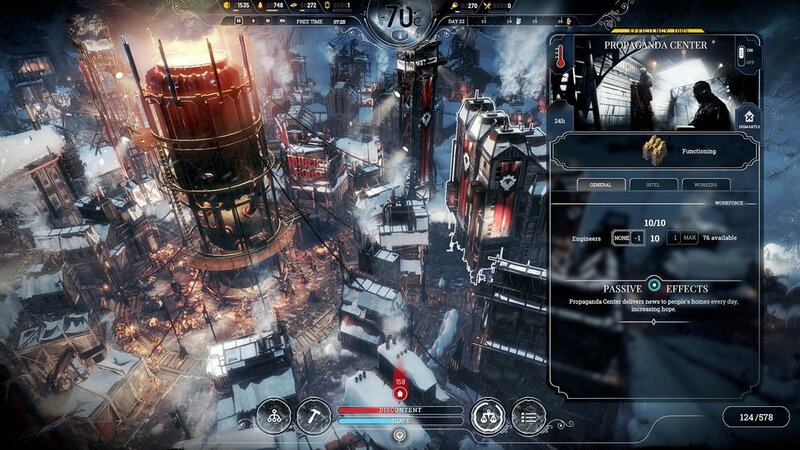 Further down the line, Frostpunk lets you form scouting parties, erect outposts, and even build a sprawling network with other communities. But even then, that emotional arc continues into the bigger picture, such as when you hem and haw over sending scouts to help survivors out in the frozen wilds. Your choices build to the narrative of an outpost becoming a civilization, and it's up to you the degree to which that story is filled with hope or despair. Ultimately, that's the dazzling flourish on the masterpiece that is Frostpunk: a game with gorgeous visuals, hard-bitten scenario design, and powerful thematic consistency. Frostpunk lets you forge a narrative through-line into your playthrough in a way that no other city builder does, making it the definitively chilling take on the genre. Top notch art and sound design make this an exquisite experience for the eyes and ears.